The American Eugene Polley has died from natural causes at the age of 96 in Chicago last month. He changed our lives. Because he was the inventor of the Remote control back in 1955 when he worked as an engineer for Zenith Electronics in Chicago. a bonus of the amazing sum of $2000.-. The remote control sent a beam of light to photocells in each corner of the TV screen, and each corner activated a particular function, e.g. on/off switch for the picture, on/off for the sound or change channel. This magic wonder was marketed under the name of ‘Flash-Matic’, and the described advantages of having such a gadget were not exactly understated. “A magic flash of light from the other end of your lounge switches your TV on or off or changes channel. And you can stay in your favourite chair” was one of the ads at the time. The alternative was to get up out of your chair, walk all the way over to the TV and turn the knob to change to one of the few other channels available. Mind you, you could also “switch the sound off for the dreary advertisements whilst the picture remained on the screen”, another selling point. “Absolutely harmless to Human Beings”. 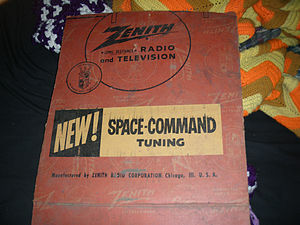 And it was also necessary that the TV was Zenith’s own Flash-Matic brand, but imagine having a wireless remote controller, a distinct luxury, which we today regard as indispensable. Eugene Polley was awarded an Emmy in 1997 for his contribution to the development of today’s TV with its multitude of channels. He always kept one of the original remotes handy, and managed to obtain 18 patents in his 47 year career as an engineer. This entry was posted in Tech-Trends and tagged Emmy Award, Eugene Polley, Remote control, Television, Zenith Electronics by Thor. Bookmark the permalink.